Chicken Enchilada Rice Bake Recipe - chicken, black beans, corn, Rotel tomatoes, cheese, rice and enchilada sauce! SO good! I wanted to eat the whole pan! Use rotisserie chicken and this is ready for the oven in 10 minutes. Super quick Mexican dinner recipe. A few months back, I made a yummy Salsa Verde Chicken and Rice Bake. It was delicious. Since I made a salsa verde bake, naturally I needed to make a red enchilada rice bake. 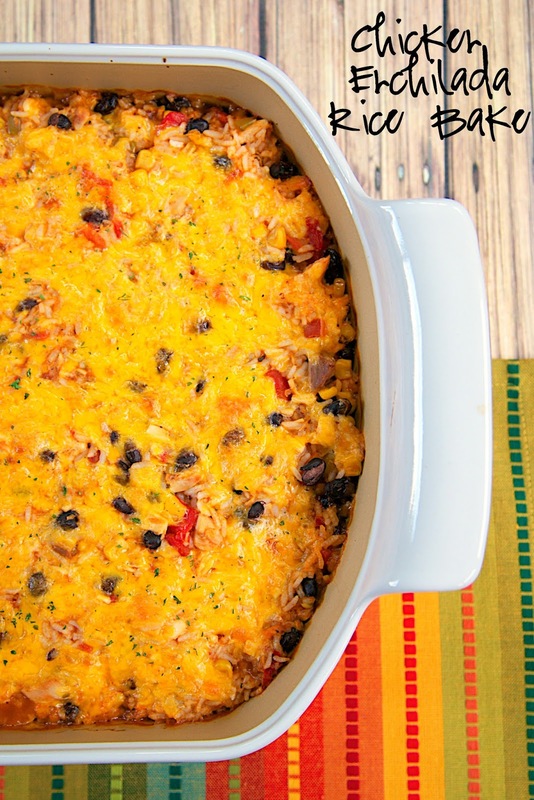 This Chicken Enchilada Rice Bake is packed full of deliciousness - chicken, black beans, corn, Rotel tomatoes, cheese, rice and enchilada sauce! It was SO good! I wanted to eat the whole pan. We did save some for lunch the next day, and it tasted great reheated. This Chicken Enchilada Rice Bake is really simple to make. I used my favorite shortcut, rotisserie chicken, and it only took about 10 minutes to make. I used instant white rice for this casserole, but brown rice would be great too. Just keep in mind that brown rice takes longer to cook than white rice, so read the instructions on the package before making it for the cooking times. 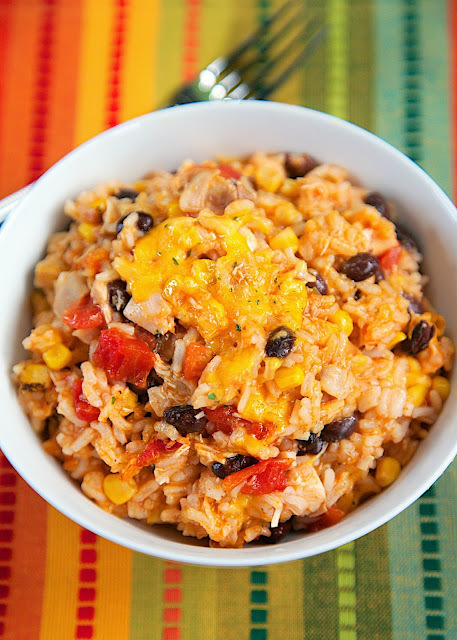 In a large bowl, combine cooked rice, chopped chicken, black beans, corn, Rotel tomatoes, 1 1/2 cups of cheese, enchilada sauce and chicken broth. Pour into prepared pan. Top with remaining cheese. I have a question, the last ingredient shows as "1/2 cup chicken broth or water" but the recipe directions don't say where to use that ingredient? You add it when you mix the chicken, veggies, rice, sauce and cheese. I updated the directions. Thanks! Yum, this looks fantastic. Even better, it's a dish my whole family would like (gotta grab onto those when I find 'em)! This rice looks amazing! My kids would devour it in a heartbeat!!! Having this for dinner tonight and sharing part with a neighbor. Thank you. Looks good. Would that be 2 cups of dry or cooked rice? Would that be 2 cups of dry or cooked rice? It is 2 cups of uncooked instant rice. The directions tell you how to cook it. If I used non-instant rice (like uncooked white or yellow rice) would i completely cook it or par-cook it? Any thoughts on using riced cauliflower in place of the rice?? I used steamfresh cauliflower rice and it turned out great. Wonderful flavor and not as many carbs. Loved it!